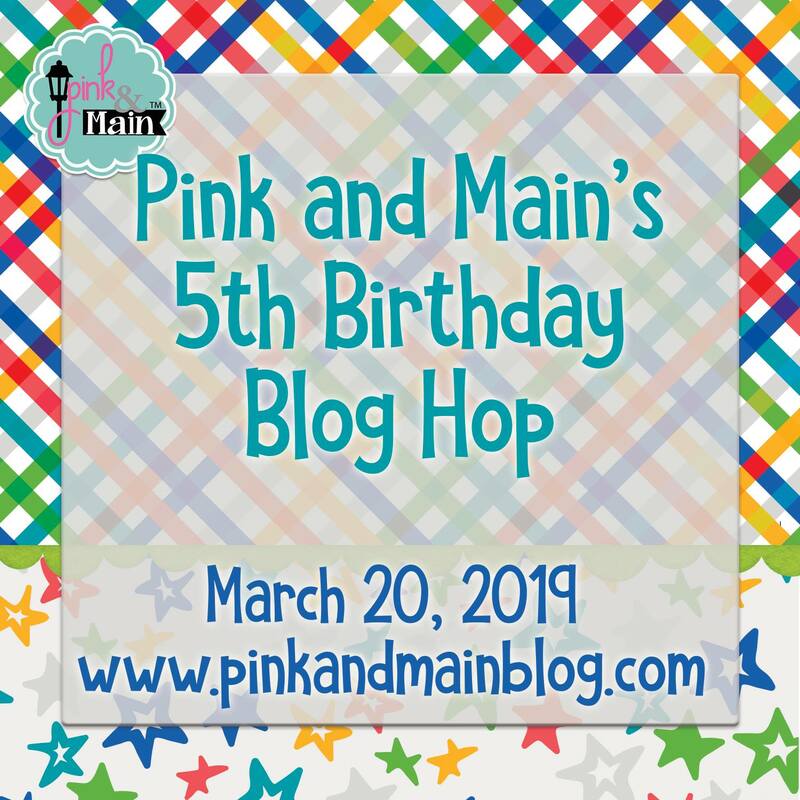 Today I am very happy to join Pink And Main's 5th Birthday Blog Hop! Today Pink And Main celebrates 5th Birthday with Blog-Hop and launches March release. Pink And Main generously offers you a chance to win one of the five 50USD store credits. To participate in the draw you should comment on all blog stops by March 24. Five lucky persons will be announced on the company's blog on March 25. 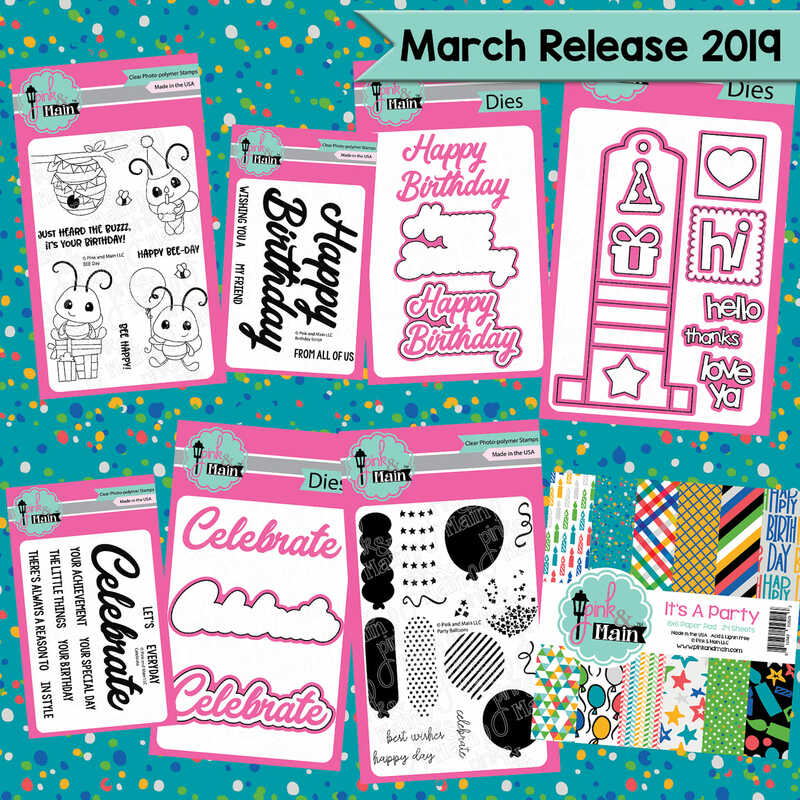 The whole release is Birthday and Celebration themed and includes two stamps and matching dies sets with images and two sets with bold sentiments. 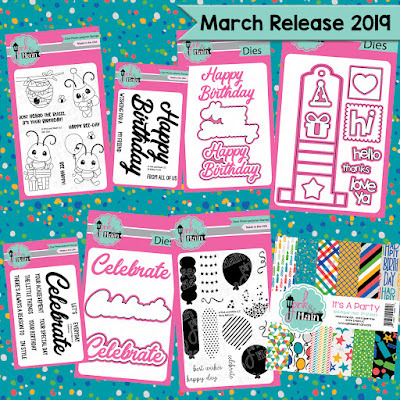 There is also the Pull and Flip dies set for making an interactive card and a festive patterned paper pad. 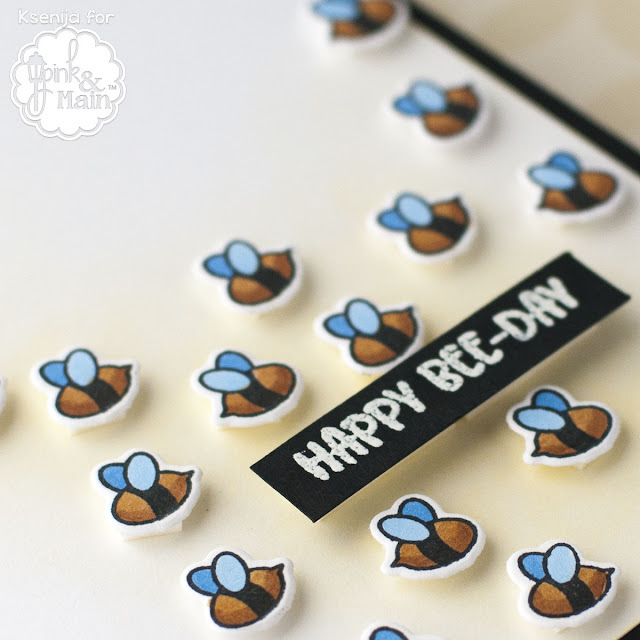 For my card I picked a wonderful stamps set the BEE Day and the matching dies. All the images are stamped with alcohol marker friendly ink and coloured with Copic Sketch markers. I die cut a cluster of bees and popped them up with my favourite super thick foam tape. To make them stand out I lightly sponged yellow ink onto the card panel. The sentiment is heat embossed in fine white powder onto a black stripe and mounted with a double tape for extra dimension. I thank you for stopping by and leaving a comment to this post! I appreciate if you subscribe as a follower to my blog. Let me know you came by and I will return you the favour. I love all those little bees! So cute! I really adore the popped up bees! Putting some really light yellow on the background was a great idea to create some extra flair as those bees fly by wishing a happy beeday! So cute! SO cute. I love the 3D bees. Nice wings, too! Love how you changed up the colour of the bees and popped them up! Sweet card, I adore this! Oh my goodness!! Those bees are adorable. And using the yellow ink behind them is genius!!! Awww the whole swarm came out to say happy birthday! So cute! 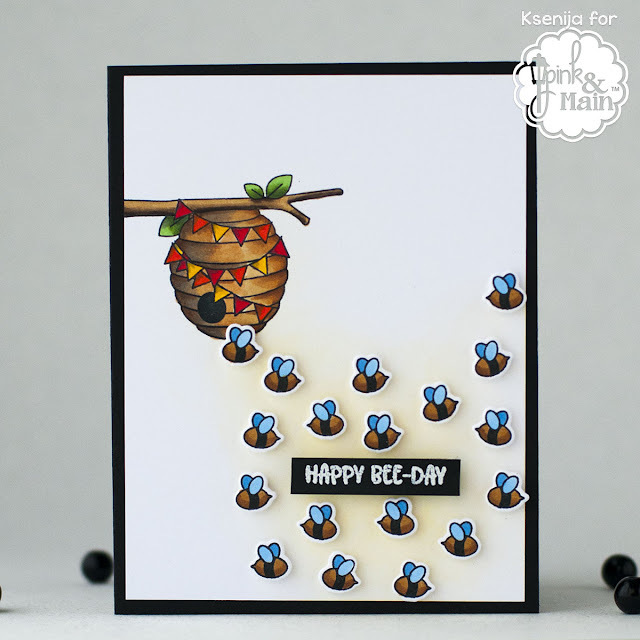 What a cute little card, I love the bees coming out of the hive and around the sentiment. Thank you so much for sharing. The blue wings on these little bees are adorable. Love how you colored those bees! Love all the little bees. Nice design. This bee are so cute. What a fun card. I love those little bees, and your layout is wonderful. Very cute and sweet card. I love the festive hive and the punny sentiment. Super cute card idea ! Love the way your bees look like they're flying! So cute! I love that you colored all the bees with blue wings! Great card! 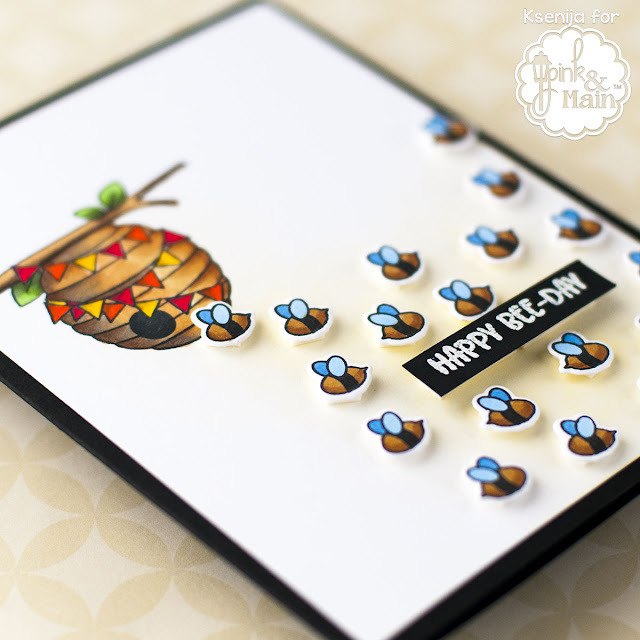 Awesome coloring on your bees and hive! Pretty card! What a great design, I love it. Omg all of those little bees, love this! Love the cluster of bees from the bee hive! So fun! Now, this card is just plain cute & clever! Love it! Very cute with all of the little bees. I like your coloring. I love the brown and blue combo. Gorgeous! 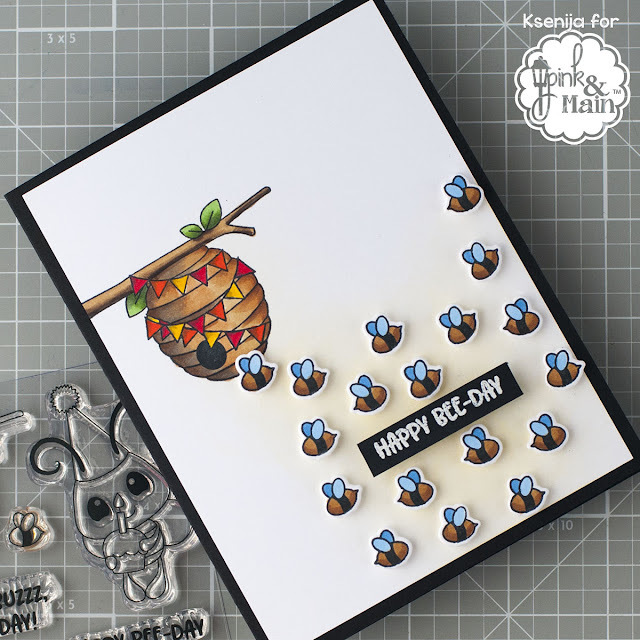 Love your card and the swarm of bees! Awesome! Such a cute card. Love all the little bees. Beautiful card Ksenija. Just love the new release fro Pink and Main. Love these little bees!!! They are adorable!! Your coloring is wonderful - love the cute scene you created! Love the fun scene, cute bees and coloring!! Absolutely beautiful!! Oh those sweet bees just make me happy. Adorable card and vibrantly fun colors. Adorable card! I love all the little bees you added! Your coloring is beautiful, and I like the light ink blending behind the bees. 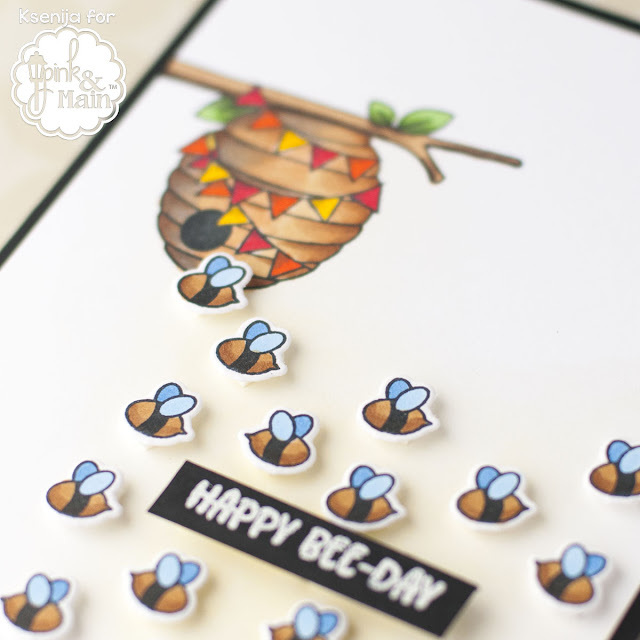 What an adorable card--I want to be part of your hive! All those little bees are adorable, great idea!! Love the simplicity of your card, such a cute image to play with!!! Adorable card! All of the little bees make it so cute! Wonderful coloring! Thank you for sharing! Love, love, love the blue wings. Such a sweet card. This is a cute little scene.